In many cultures, dog is considered a delicacy and dog is so much better when served friendly. After all, nobody wants a mean dog salad. 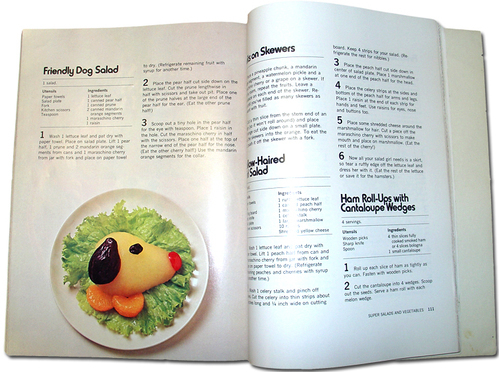 Friendly Dog Salad comes from Betty Crocker's Cookbook for Boys and Girls. I guess the good folks at Betty Crocker think that kids will actually eat prunes if disguised as a friendly dog's ear. This cookbook also has a recipe for a cake that looks like a hamburger and a hamburger that looks like a cake, frosted with mashed potatoes. I guess these fun recipes are for fussy kids who won't eat hamburgers or cake unless cleverly disguised.